up to and including the age of 3. 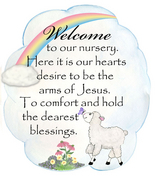 The nursery is open for the entire church service. All nursery volunteers have completed the necessary criminal background checks and child abuse clearance forms.